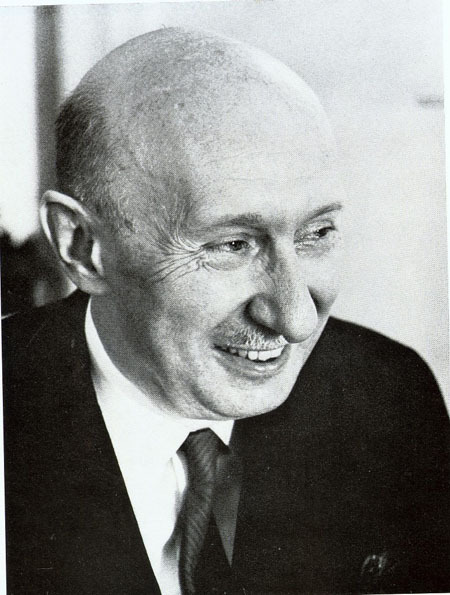 Von Békésy was born in Budapest, Hungary, on June 3, 1899. His father was in the diplomatic service, a job that took the family to various European cities during Georg’s youth. He was intrigued by gypsy music, and he later attributed his life­long interest in sound to this boyhood passion. In 1923 he earned a Ph.D. in physics from the University of Budapest for a thesis on fluid dynamics. Upon graduation, von Békésy began a 23­ year association with the laboratories of the Hungarian Telephone System. Employed as a communications engineer, he soon began investigating the physics of human hearing to help solve the practical problems of telephone systems. Physiologists had not yet determined how sound is translated by the inner ear. During his tenure at the telephone laboratories, von Békésy also worked at various other European research institutions. For two decades, he carried out numerous experiments aimed at determining the physiology of the cochlea, the part of the inner ear involved in hearing. To do so, he designed and built various miniature tools and, with the help of tiny mirrors, observed changes that occur in the cochlea as it receives sounds. In 1947, von Békésy immigrated to the United States to accept a research position at Harvard University’s Psycho­ Acoustic Laboratory, where he built a large model cochlea. The model consisted of a 30­centimeter plastic tube filled with water. He placed the tube along his forearm and stimulated one end of the tube with a sound. His forearm detected sound waves of different pitches at distinct points along the tube. From numerous experiments with the model, he concluded that sound moves through the fluid in the cochlea in a “traveling wave” and produces a vibration at one particular point along the cochlear membrane. The wave’s pitch determines the location of that point. The vibration then stimulates adjacent cells to send an auditory message to the brain, which interprets the sound as having a particular pitch. Von Békésy’s work earned him the 1961 Nobel Prize for Physiology or Medicine; he was the first physicist to win a Nobel Prize in that category. He took a position at the University of Hawaii in 1966; he died on June 13, 1972, in Honolulu. Von Békésy’s discovery of the basic physiology of the inner ear enhanced the understanding of hearing, the development of surgical procedures, and the diagnosis and treatment of hearing disorders. His work influenced that of other pioneers in the study of hearing. In 1954 Ernest Glen Weaver and H. Lawrence further investigated acoustic physiology at various levels of the ear, and in 1960 H. Engström created electron microscope images of the organ of Corti, the structure inside the cochlea that contains the receptor cells that detect sound waves and their different pitches. Von Békésy’s research led directly to the design of an audiometer, a device that determines whether a person’s deafness is caused by damage to the ear or to the brain. This instrument enabled physicians to prescribe the appropriate treatment at an early age for patients who were born deaf. His research also provided the foundation for the development of instruments enabling deaf people to “hear” through tactile sensations. His model cochlea was one such instrument: placed against the forearm, the tube allowed a person to feel differences in pitch due to the vibration (caused by sound waves) of distinct points along the tube. Contemporary hearing aids now electronically amplify sound with the use of transistors, but without von Békésy key discoveries about the physics and physiology of human hearing, modern advances in hearing aids would not have been possible.